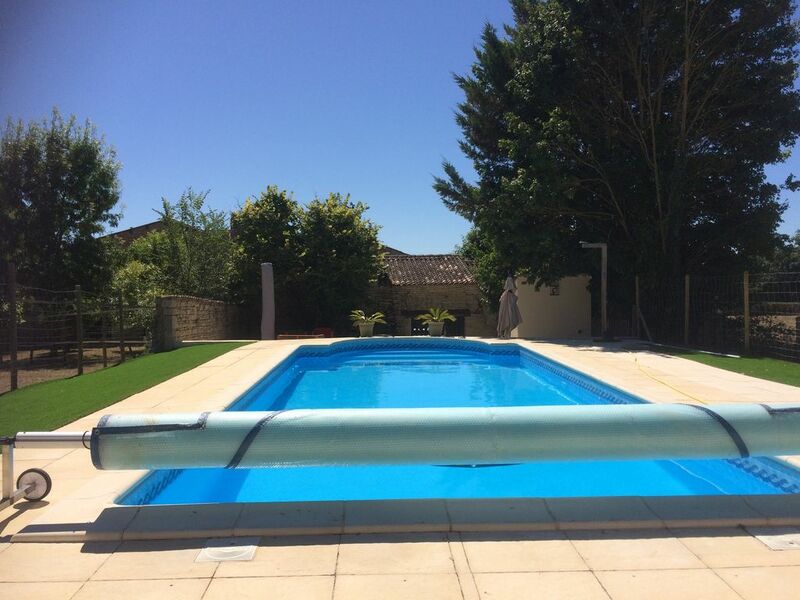 5-bed stone house, sleeps 12 with large pool in secure grounds, near Cognac. Large character 5-bedroom tastefully furnished Charantaise stone house in 1 acre of grounds with swimming pool, UK TV (with DVD library) and wi-fi, two kitchens and two bathrooms with all appliances and a new wood-burner for winter warmth. The house sleeps up to 12 people, has secure parking; and we accept dogs. Set in rolling countryside the location has excellent river and woodland walking/cycling paths, with both Villejesus and Aigre in walking/cycling distance, perfect for the morning croissant run. All amenities are nearby including bakeries, restaurants, bars and markets. The supermarket in Aigre is 3km away. The bar/restaurant at Villejesus provides outstanding food and a beautiful bar environment, whose proprietor, Stefan, speaks perfect English. This is a 20-minute walk alongside a beautiful trout-filled river, following tree-lined paths - a real treat! Located 25km North West of Angouleme, the property is 75-minutes’ drive from Limoges airport, 55 minutes from Poitiers airport, 90-minutes from La Rochelle airport and under 2- hours from Bordeaux airport. We are just 12km from the N10 at Mansle. The house has been extensively up-graded and is surrounded by open countryside. The Charente River is nearby with parklands and water sports. There are two racecourses nearby (5 and 15 minutes drive away). The house is 25 minutes from Jarnac, 35 minutes from Cognac, 25 minutes from the stunning village of Verteuil-sur-Charente, and 90 minutes from the Atlantic coast. The property is the last in a small hamlet 250m from a large chateau. The front is south facing with seating and tables/chairs. Both the frontage and large rear courtyard are high stone-walled providing privacy with access through high steel gates. The hamlet is surrounded by fields, rivers and woods with open country. The swimming pool (10m x 5m) is located in the rear grounds and is securely gated and fenced as required by French law, with views across open countryside and plenty of space for relaxing and sun-bathing. The pool has two patio areas and sun-loungers, with tables for alfresco dining to enjoy the stunning views. The pool is cleaned twice weekly and a pole net is available to capture any bugs or leaves in the pool. There is a cold-water shower to the pool and an evening pool cover. The rear garden is over 130 metres long, tree lined with panoramic views across the valley behind the house where you can walk freely. This whole area has the sun all day. Beyond the gates we have great bicycling and walking country as there is minimal traffic and many paths winding across gentle rolling countryside. The Charente region has the second most hours of sunshine in France after the Mediterranean, so prepare for long, hot days. In the larger of the two rear courtyards there is a large gazeebo, hot-tub, barbecue, dining furniture and sun-loungers set aside stone barns in complete privacy. A table tennis table is provided and there are bicycles, and tennis rackets. The large courtyard is lightly stoned and can accommodate games. The smaller rear courtyard leads to the pool area and is elevated providing shade and full views of the pool and rear grounds, with a patio and seating. Wildlife is extensive from red squirrels to deer as well as trout in the nearby rivers and streams. Birds of prey abound and the local peacocks in the nearby chateau are a delight. The front and side of the property is heavily planted to help camouflage the dry-stone walls and promote bird access. Established vines grow against the side of the main house and the rear barns. Within 1-hour’s drive there are numerous attractions including golf courses, water-parks, swimming lakes and La Vallee des Singes (monkey park). We have a detailed house Information Pack which we forward to guests. We are from Liverpool and are a couple who have been in love with France since the early 1990s. We are easily contactable and look forward to welcoming you to our beautiful French home. The house was bought in 2012 after we sold our first French property in Brittany. For the last 7-years we have welcomed dozens of friends and family at all times of the year who have enjoyed the beautiful weather, the wine and what the house and its grounds offer. We are spoilt for our choice of countryside, walks and bike-rides. All amenities are nearby though the house benefits from being distant from traffic and secure in high-walled grounds - perfect for young children. The bar at Villejesus, in our neighbouring commune, is a gorgeous 20-minute walk away along the river path, where owner Stefan provides great food at reasonable prices with a warm welcome. Nearby Aigre offers two more restaurants, a supermarket, banks, 2 boulangeries, a bar and smaller shops selling local produce with a market every Sunday morning. Aigre also has a tourist information centre that giver up-dates on local fetes and activities throughout the summer months. Golf and horse racing are available locally, as are water-sports. The house is ideally set-up for two families to share but with sufficient privacy from the design/layout of the property. Although it is one large property each side of the house has its own staircase, bathroom and kitchen. There are safe play areas and we allow animals. Fire should not be lit from May 1st - October 1st. Note the fire in the TV room is un-usable as chimney blocked. The details of password etc. are at the final page of the House Information pack. Bikes, table-tennis table, tennis rackets and swimming pool equipment are located in the large rear storeroom/barn. See rear of front-door for password details. There are two living rooms - one with open-fire, one with TV. One large fridge freezer in large kitchen, one fridge in small kitchen. Four-ring bottled gas in each kitchen. Each kitchen has an oven. There is a toaster in each kitchen. Range of pans, cutlery, crockery and glassware in each kitchen. 2 fully resourced kitchens - one small at the front of the house, one large at the rear of the house which adjoins the dining area. Large table and chairs in rear kitchen/diner. Tables and chairs for out-door dining. There is a large gazeebo stored in the covered area of the courtyard. Three terraces: one at the front of the house, one at the pool and one nearby. Rackets provided. There is an all-weather court at Villejesus behind the church. Much sun-lounger space. Shaded pool-side patio area, positioned for supervision of children in the pool. Cold-water shower near shallow end. Ensure pool cover goes on every night or if a storm due. Fits 4 people in shaded area of covered courtyard. Please keep clean and use the disinfectant. Lovely house with plenty of room and a lovely pool in the sun! The house is nice with plenty of space. Nice to have so much usable outside space as well. We had a very relaxing holiday spending most of our time around the pool. Stefan's restaurant serves incredible food. The local Carrefour Contact is big enough for all your food shopping needs and only 5mins away. Everything you need very close by. Further afield there's plenty to do. Would highly recommend visiting Aire de Rejallant, a lovely part of the Charente river where you can have a swim and hire canoes. La Rochelle is also worth a visit for a day out. The only thing that slightly annoyed us were the flies but that's not the property's fault, would recommend taking some fly repellent of some sort. I would highly recommend the property for large family's, works great with dogs as the whole grounds is secure. Andrea and Phill are very helpful and were willing to do anything for us. All in all we had a great holiday! Thank you Rhys for taking the time and giving a positive review. Your Charente river trip recommend is very helpful; and yes Stefan's food is incredible. An amazing property set in a lovely, quiet, picturesque location! We were welcomed on arrival by Andrea and Phil and shown around the stunning property and grounds and made to feel at home straight away! We had two very young children with us so it was ideal as we could use the pool and the property as we pleased and did not have to worry about anyone else! There was plenty of room for us all especially travelling with a baby and there was plenty of space to relax and enjoy the surroundings! The local villages are not far and are ideal for a meal at the local restaurant or fresh croissants at the bakery in the morning! We had a fantastic time and would definitely go back! Hello Paul and your family. Glad you all enjoyed your stay and the house and locality was able to meet your needs. Everyone who stays enjoys their holiday, with the added confidence that Andrea and Phil are on-hand if necessary. We booked La Talonnière so that our families could reunite in France (my sister and her family from the UK, and me and my family from the US), and in order to be close to my parents in Mansle. There were four parents, two teenage boys, and two college-age girls, and the house was perfect. Thomas and his on-site connections were very helpful and kind, and welcomed us with a roaring fire. The house was a superb place for all of us to stay. There were comfortable beds, ample hot water, and plenty of options for heating (fire, space heaters, and central). The location was beautiful, and the proximity to Aigre and to Mansle meant that we had everything we needed for our mid-winter trip. We look forward to returning and enjoying the countryside in the summer next time! It was a pleasure to have you stay. As our first mid-winter guests we are pleased the house met your needs. What a wonderful place to stay! We were made to feel at home from the outset. The house is stunning, in an idyllic rural location away from all the hustle and bustle of city life. It's very easy to travel around the local area - walking or making use of the bikes on hand and to venture a little further for day trips. Ten of us stayed comfortably in the house, especially enjoying being able eat outside and make use of the lovely courtyard area. We loved the swimming pool and seating area around it. The housekeepers made us feel welcome without encroaching and were on hand if we had any questions. All in all we had a fabulous time and are already thinking about a return visit! Thank you so much to Tom and Lily for such a spectacular holiday. Thank you John and Dominique for your review and positive comments. All first-time visitors are impressed by the locality, the space and peacefulness. Our stay was great ! Plenty of room for our family to be together or find a peaceful corner to read or ponder. The pool is gorgeous and kept very clean by the aid of the pool-man who visited twice weekly. The caretakers were on hand and very helpful indeed. The provision of wine on arrival was much appreciated - what a kind action !! Our three week summer holiday was very very good, pity we had to return home. Thank you Tom. Thank you Olwen for taking the time to provide a review. Really pleased your family enjoyed the house and the pool, and thank you for the comments about Andrea and Phil who do look after our guests very well. We had a lovely 10 days here in June, very quiet, peaceful and relaxing. A beautiful region of France where the local were very friendly. The villa was fairly well equipped and the Housekeeper and Handyman, Andrea & Phil were always on hand to assist with anything. Tip for Dog Owners - I would not recommend the local Vet in Mansle though, they forgot to sign one part of the Pet Passport which led to a self guided tour around Calais at 7am in the morning trying to find a vet that would sign the pet passport. Thus resulting in missing the allocated tome slot for channel tunnel train and double the vet fees. There are supermarkets in Mansle and nearby Aigre and also a number of restaurants; note check opening times for these restaurants esp on a Monday! Otherwise the food eating out is of good quality and well priced. I would recommend this place to friends or family, it is large enough for a couple of families to stay there. Yes the house is as you say 'lovely', and our housekeepers are very friendly - standards we will maintain. Everybody who visits enjoy the local countryside and the grounds to the house. Glad you enjoyed the local eateries. Will amend the House Information Pack to assist guests with dogs on checking exactly what is required in the passport from the vet. Will also note the Monday closing in Aigre, though Stefan remains open in Villejesus that day. If you are using a sat-nav or Google maps be careful not to just rely on the post-code for our definitive position. The 16140 post-code covers several villages and local hamlets - some are 4km from La Talonniere! Use the satellite/map above to see access from Fouqueure via Mansle or from Aigre. The house is the last in the hamlet to the right, immediately after the small T junction. A link to Google maps is in the house information pack which is emailed to all guests before your holiday. The House Information Pack provides more information on the house and its environs.